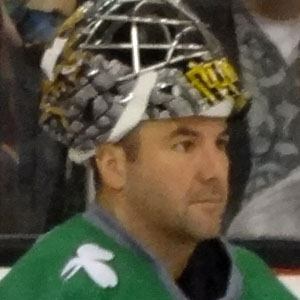 Nine-year goaltender for the Dallas Stars who set franchise records in wins, shutouts, and minutes played by a goaltender. He spent his first couple of years in Dallas learning the art of goaltending from Ed Belfour. He was named to his first and only NHL All-Star game in 2002-03, his best season overall where he was a finalist for the Vezina trophy and led the league with a .932 save percentage. He grew up in Sault Ste. Marie, Canada. He had a record three shutouts in a playoff series against the Vancouver Canucks, a record that was tied by Martin Brodeur.